Research shows that water is critical for a healthy body. Other research shows that eating honey can also provide health benefits. What is less well known is how adding warm water and honey into a healthy diet combined with exercise may actually help you to lose weight. While not a guarantee, this simple home remedy of honey with hot water for weight loss may be just what you need to get started. Why Can Honey with Hot Water Help with Weight Loss? Many of us consume too much sugar or processed food, which is a great obstacle in losing weight. Consuming honey can provide with us the sweetness that our taste buds need and avoid the empty calories at the same time by controlling our cravings for junk food. Many people get a high proportion of their calories from beverages sweetened with sugar. If you substitute honey and water for these beverages, you can cut those calories by as much as 63%. For example, there are about 150 calories in a 12-ounce soda and 170 calories in a latte coffee. Contrast this with the 64 calories contained in one tablespoon honey mixed in one cup of water. Combing honey with warm water can be a great way to lose weight because it can help with proper breakdown of foods, especially when drinking in the morning. This mixture also serves as a cleanser, which washes away unwanted toxins from our body. Besides, our body gets a boost of energy by drinking honey with warm water, thus increasing the metabolism. The desired sweetness of the drink will determine the amount of water you use in the water. Experiment with the amount of water that you need to mix with a tablespoon of honey. If the cells in your body are not getting enough fluid, they will send a message to your brain to begin retaining water. The more water you use in the water and honey drink, the more water weight you can lose as your kidneys work to eliminate the excess fluids. Drink at the right time. Drinking a glass of honey in hot water before and during a meal may make you feel full faster and for a longer period of time. Because you will eat less food, you will begin to lose weight. Drinking this mixture early in the morning is also a great boost in energy. Honey with lemon. Instead of using plain warm water, try mixing a teaspoon of lemon juice into the honey water. The sweetness of the honey and the citrus flavor of the lemon will provide a refreshing drink. Tea with honey. Before breakfast in the morning, enjoy a cup of hot tea sweetened with honey. This mixture will decrease your appetite and prevent sugar spikes later in the day. Honey with cinnamon. As another alternative to plain warm water, add a tablespoon of cinnamon to the mixture. Besides possible weight loss properties, this mixture can add a fresh, spicy smell to your breath. Apple slices with honey. Wedges of apples dipped in honey provide fruit, fiber and the quick energy. For a quick, ready-to-eat treat, slice up an apple and sprinkle the slices with a tablespoon of honey and sprinkle with cinnamon powder. Granola with honey. Granola and honey combine to make a healthy breakfast or snack that is simple to make. Simply mix a cup of yogurt with a tablespoon of honey, a teaspoon of lemon juice, and ½ cup of granola. Rich in vitamins and fiber, this breakfast mixture will help you lose weight. Chicken breast with honey. Boneless, skinless chicken breast basted with honey and grilled over fire will result in a caramelized grilled chicken that is low in fat and calories. Although honey water can be a great supplement to your diet, there are a few cautions. If you have trouble with your blood sugar, you must remember that honey is packed with simple carbohydrates that can make your blood sugar increase very quickly. Honey also contains a lot of calories for the amount of nutrition you get. Be sure to measure the honey you consume so you know exactly how many calories you are taking in. Although a simple sugar, honey has a lower glycemic index than processed sugar so it is less likely to cause rapid fluctuations in blood sugar. Sweeter than processed sugar, it takes less honey to make your food sweet. 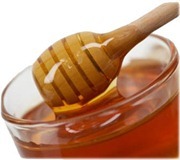 Honey may prevent constipation because it is a natural laxative. At the same time, honey may help relieve diarrhea. Honey has antioxidant, antibacterial and anti-inflammatory properties that may prevent cell damage and help fight infection. As an efficient form of carbohydrates, honey can be used pre- and post-exercise to provide energy and decrease recuperation time. Honey may reduce the LDL cholesterol which may decrease your risk for atherosclerosis. Research shows that eating local honey may decrease your susceptibility to environmental allergies.